In our Office generally we word on one PC.. there a one pc where project share and we all toghter work on specific file in one place in one pc.. its locallaye configure in Notepas++ usuing Light explorer..
use Network can easily work on Sublime. But I am useing PhpStrom and tried to configur.. Please can anybody Help me..?? How i solve this problem? 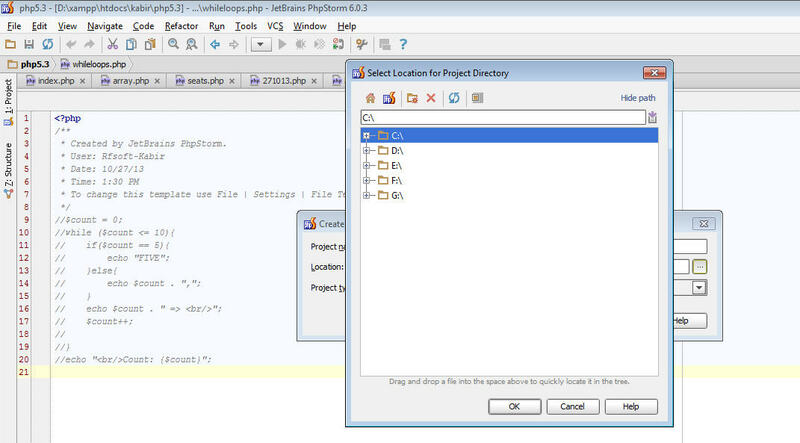 I attach a photo here..
1) PhpStorm does not support working with network paths directly. 2) Working over network (files located on some network server/computer) is not officially recommended as IDE requires on very fast access to it (which is something that network often lacks). 3) The recommended way is to work with local copy of the project (copy all required files to your computer) and then setup automatic synchronisation (Settings | Deployment) so file gets uploaded to the network after save. In any case: you can work via network directly (but you have been warned) -- for this you need to map your network share as a drive (assign a letter; restart may be required) on your local computer (e.g. Z:\ ). After this oepration you should see it on that screen. Thanks Andriy Bazanov.. Its Work Now..